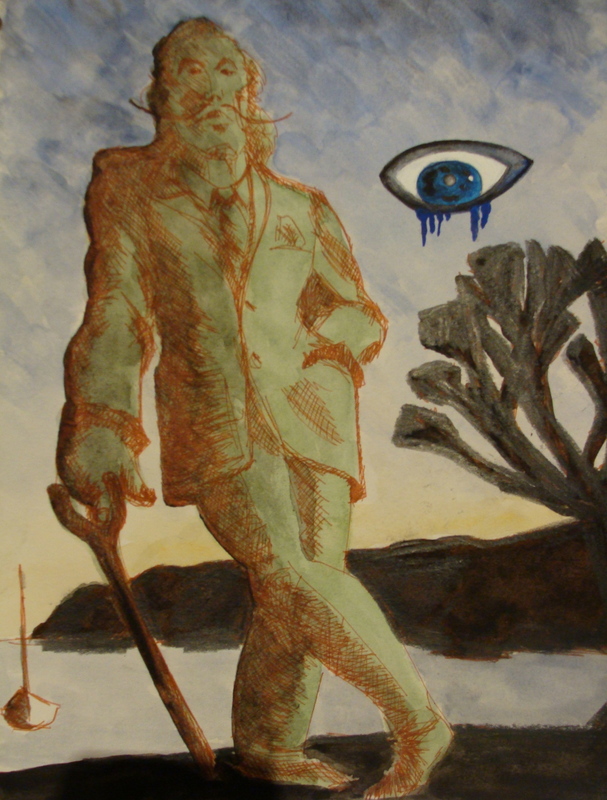 Sketch of Salvadore Dali statue in surreal Cadaques, Catalonia. Copyright Robin L. Chandler 2013. Maybe it’s gravity, centrifugal force, or just the force of my own nature, but I always find a comfortable place to anchor, while traveling amongst the new. No surprise confession here, but I love comfortable places where friends talk over wine and beer, and in Barcelona, I will add Els Quatre Gats to my list. Of course given my current obsessions with cycling, it helps a lot that the café features a mural size art nouveau style painting of two cyclists on a tandem by Ramon Casas. Opened in 1897, Els Quatre Gats was a home to the artists and intellectuals participating in Barcelona’s Modernisme movement. It was a favorite place of Picasso, who came to Barcelona to study painting, laying the foundation for his Blue Period. Picasso had strong connections to this region, personally requesting that the Museo Picasso be built in Barcelona. Over glasses of cava and grilled calamari, we talked about our day visiting the northern Catalonia towns of Figures, Cadaques and Port Lligat on the “Salvadore Dali Trail,” and mused about the two artists and their context within the Spanish Civil War. Painted in 1937, Picasso created Guernica in response to the then recent bombing and destruction of the Basque village by German and Italian warplanes allied with Franco’s forces fighting the Spanish Republic’s Popular Front. Guernica was first exhibited in June 1937 at the Paris International Exposition by the Spanish Republican Government and then travelled to England and the United States with the hope of raising awareness and sympathy for the elected government of the Spanish people. Picasso, who died in 1973, never returned to Spain while Franco was dictator. 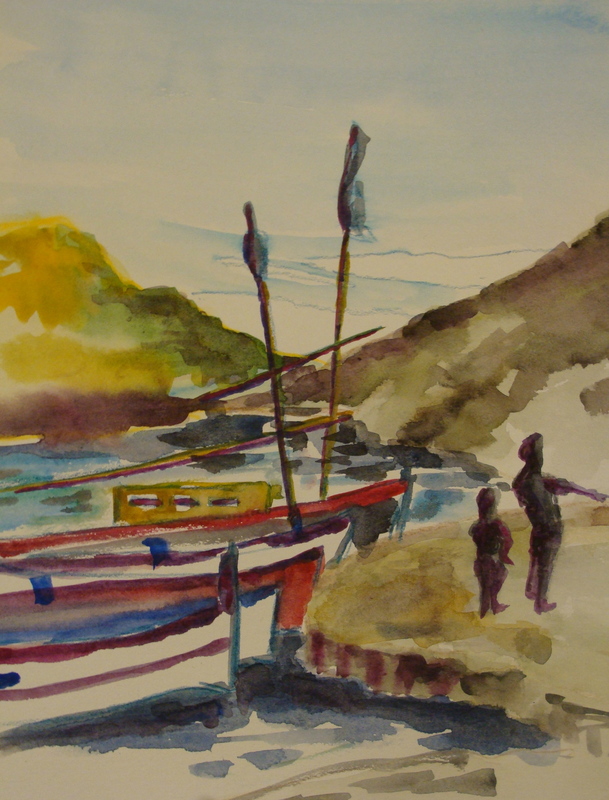 Sketch of harbor near Dali’s home in Port Lligat, Catalonia. Copyright Robin L. Chandler 2013. In 1936, Salvador Dali painted Soft Construction with Boiled Beans (Premonition of Civil War). Known as a Surrealist, Dali worked in what he described as the paranoiac critical method to access the subconscious for greater artistic creativity. While sketches for the painting are dated to 1934, Dali felt the painting described the many hardships endured by Spaniards during the Spanish Civil War. In 1934, Dali was expelled from Surrealism by Andre Breton and the other Surrealists allegedly because of his ambiguous position on the relationship between politics and art. Dali returned to Spain in 1949, living in Port Lligat until his death in 1989 fully embracing Franco’s dictatorship. Happy New Year Robin! I just checked your blog to find this fine essay! You might be interested to read more abt the Spanish Civil War in The NYReview of Books..Dec 19th issue..Orwell: Homage to the “Homage” by Adam Hochschild. I thought I “understood” this conflict having been born into it (in 1934) and read abt it, but there are many parts of it that have escaped me. One does not learn history through”osmosis”! 2 years ago, there was special exhibit of some of Picasso’s paintings in Toronto. Amazing he did such a variety of work. Your passion of art clearly shows…probably more than cycling on your blog at this time. But then, maybe you already having some cycling (trip) posts. Happy New Year. Trot well into year of the horse.